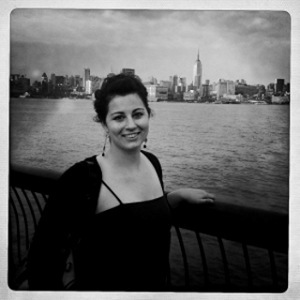 Sarah Cihat. How do I love thee? I think this lady is the bees knees. She is a true creative thinker. Her "about" section on her site says she "is best known for her Rehabilitated Dishware collection, introduced at the ICFF in 2003 and produced by hand in Brooklyn to this day. Cihat describes the distinctive offerings as "an exercise in sustainability that reincarnates existing products." 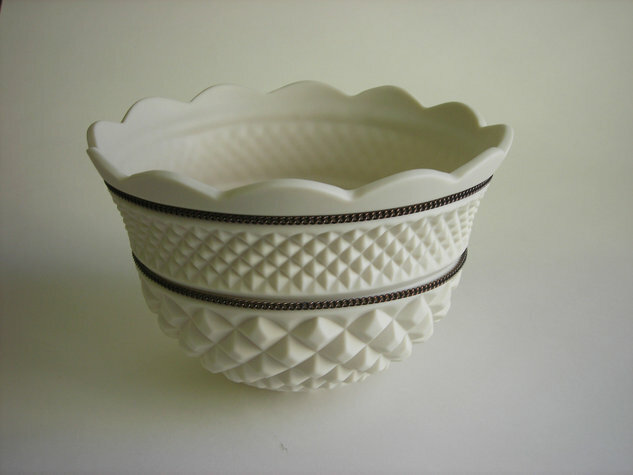 The process begins by buying dishware from various second-hand stores, such as Goodwill and Salvation Army, or rummaging through the reject pile at retail stores. The dishes are then reglazed and refired. ummm yeah, gorgeous porcelain dripping in delicate chains. This melding of ceramics and metals is the product of a collaborative effort between Sarah and Michael Miller. Innovative, cool and just flat out badass. I think she might be on to something. Am I right? I have to say, the porcelain and chains are my favorite...what's yours? Since I love adding to my plate collection hanging on my wall, I was attracted to her plates. But I gotta say...you are right. The bowls with metal are badass! 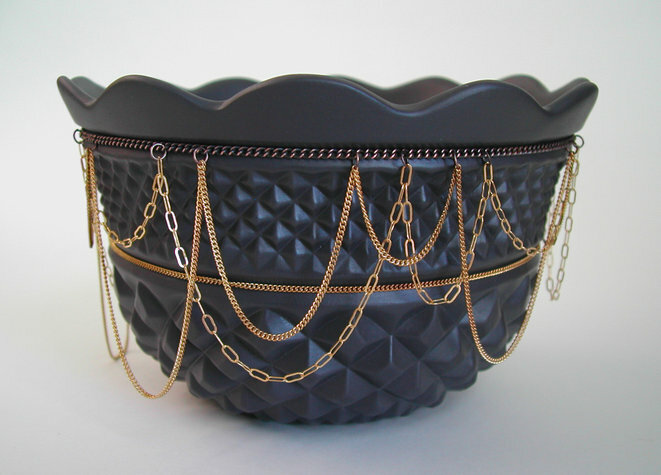 Holy crapsicks...I NEED the black bowl with the gold chain- like yesterday. 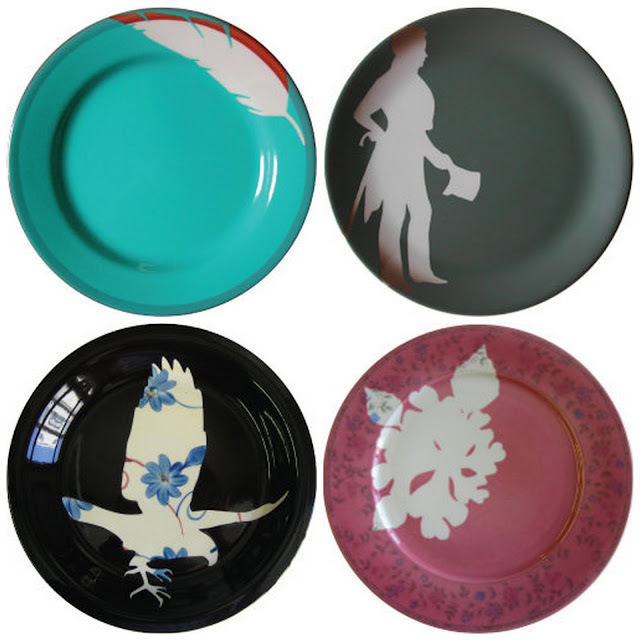 I remember the first time I saw her plates ins ome little brooklyn boutique--love at first sight! We actually considered registering for them for our wedding, but my husband's time spent in Denmark led to modern Royal Copenhagan instead. I had sort of forgotten about her--so fun to see her new pieces! 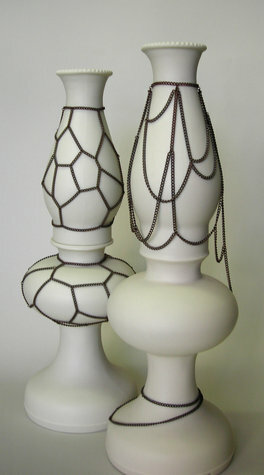 Well- I love the chain items- I would love one of these or the bedrooms I am still debating on the decor. Fits what I am thinking- not so feminine, but a touch of ecclectic. BUT- I LOVE the skull and bones plate. Would I love to buy something like that for my oldest daughter. She loves items that are out of the box-this would be perfect for her. Thanks for sharing. Blessings. OH MY GOSH!!! SARAH IS CREATIVE BEYOND MEASURE. I LOVE THE CHAINS ON THE POTS. JEWELRY FOR YOUR ROOMS. 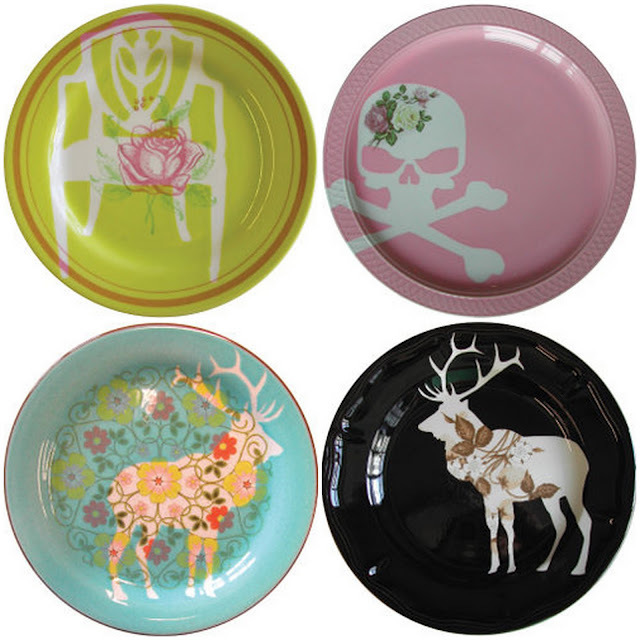 THE PLATES ARE AWSOME ...BUT THOSE BOWLS AND POTS ARE OVER THE MOON!!! ULTIMATE IN SOPHISTICATION.